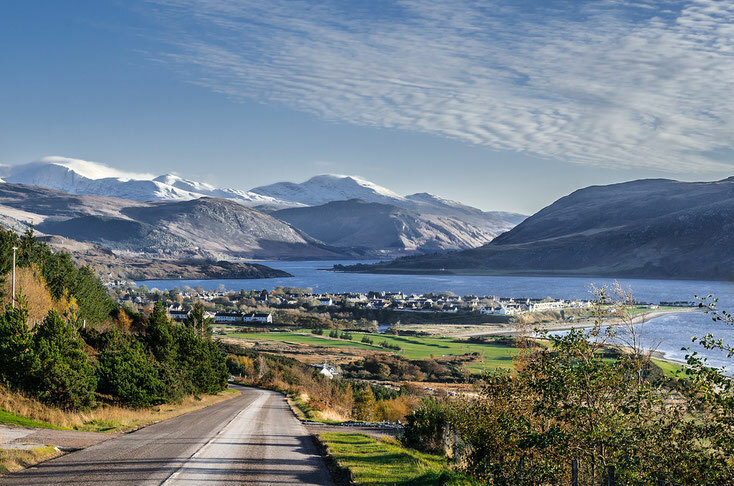 Ullapool is a charming, scenic fishing town, nestled on the shores of Loch Broom and is the gateway to the Northern Highlands and The Outer Hebrides. The CalMac ferry takes you in about 2,5 hours to Stornoway on The Isle of Lewis from where you can explore the Outer Hebrides, islands like Taransay, North and South Uist, Benbecula and Barra are definitely worth a visit. Ullapool is located on the populair tourist route NC500 and is situated in one of the least spoilt natural environments in the United Kingdom. The village itself has many places worth visiting, Thomas Telford's original design is the original part of the village and many of the buildings are very old, while walking along the streets you will see many old houses dating from the fishing generation. Surrounding sites worth visiting are Ardmair beach and bay with a lovely walk at Rhue Point Lighthouse, especially as the sun sets over the Summer Isles behind. Everyone travelling to and from Ullapool should see Corrieshalloch Falls, as they are a wonder to witness, a short walk from the car park takes you to one of the most stunning gorges in the world. The Frigate Ullapool, locally sourced products and this is reflected in their wide menu which includes everything from freshly cooked pizzas, fish (locally off the boats right outside) and burgers to home made cakes and pies.